If your dream vacation includes lots of variety, both in scenery and activities, then St. Lucia has it. The island is well-known for its changing landscape that includes the towering Pitons, black and white sand beaches, volcanoes, and rainforests. There’s also a healthy sprinkling of bustling city life, so whatever your interests, there’s something for you when you rent a villa in St. Lucia. Use the information here to help you as you plan your trip to this diverse island. Like many islands in the Caribbean, St. Lucia was inhabited long before the Europeans arrived. Arawak Indians had settled in St. Lucia about 2,000 years ago. The second wave of settlers were the warlike Carib Indians who had pretty much removed the Arawaks by 800AD. They called the island “Hewanorra” . The island was not referred to as St. Lucia until the late 1500’s. In 1746, the French established the first official settlement in St. Lucia - Soufriere. They built more towns and sugar plantations over the next 40-50 years and prospered with cheap, imported slave labor. In 1814, the island changed hands. The abolition of slavery in 1838 by the English Parliament was the beginning of the end for the sugar industry in St. Lucia. Indentured labour from India arrived in the 1880’s to alleviate the chronic agricultural labour shortages, and many of them settled permanently. However, it could not stop the overall decline of the industry and by the early 1960’s the sugar industry had totally disappeared. After the Second World War, St. Lucia sought increasing autonomy in a strive for total independence. St. Lucia became fully independent on February 22, 1979. It remains a member of the British Commonwealth. Plan a Saturday trip to Castries market for fresh produce and lots of interesting things to look at. Jeremie Street, Castries, St. Lucia. Discover St. Lucia's colorful, friendly nature while visiting the 100-year-old Saturday Market in the capital of Castries. Here you'll find bountiful bananas, the day's seafood catch, local spices such as mace, nutmeg, cinnamon, cocoa and hot pepper sauces, which make great gifts and souvenirs. In the adjacent Craft Market are baskets, brooms and other straw goods, wood carvings, pottery and local artist's wares at excellent prices. For the best diving and snorkeling on the island head to Anse Chastanet beach and rent your gear right there at Scuba St Lucia. It is located at Anse Chastanet Resort, which is nestled amidst a 600-acre tropical estate with two soft sand beaches bordering on pristine coral reefs. It is just a mile and a half from the picturesque town of Soufriere on St. Lucia's southwestern Caribbean shoreline. 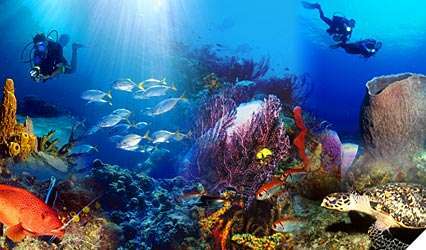 They offer boat diving, night diving and wreck diving - as well as guided snorkel tours. You can not miss this great event, tourists and locals mix and have fun!!! Anse La Raye fish fry is a popular Friday night destination for locals and visitors alike, the west coast village is just twenty minutes drive from the capital. Long-established and enjoying continued popularity is the Gros Islet Friday night street party. The generally sleepy fishing village takes on a whole new dimension by sunset Friday night when vendors set up their stalls and the first revellers stroll in for sundowners. By 9pm, the place is heaving, music emanates from towering speakers and the smell of great local food wafts through the festive air. Getting to St. Lucia and getting around. Our transportation tips will help make your trip smoother. More good sand advice. One form of identification, either a photo ID or passport as well as an on-going or return ticket, is required for U.S. citizens. Others will need a passport or visa depending on the country of origin. On the left. Seat belts are mandatory. Vacationers don’t just stay in St. Lucia villas - they come to paradise to get married and celebrate their honeymoons! You must be in St. Lucia for two days before the wedding. After the two days, a local Solicitor can apply for a license on your behalf. You need to have received this two working days before the wedding date. Most tour operators can make all the arrangements. Decree Absolute (if one of the parties is divorced); in the case of a widow/widower a Death Certificate of first spouse is required. Also, if a name has been changed, a Deed Poll is required. If one of the parties is under the age of 18, evidence of a consent of parents is required in the form of a sworn affidavit stamped by a Notary Public. Before making their way to St. Lucia villas, vacationers like to know a little bit of helpful information to make them feel more at home during their stay. Take a look at our travel tips to make your time in villas in St. Lucia even more relaxing. Eastern Caribbean Dollar (EC) - U.S. dollars accepted. Local area code is 758.